With the 60th Walkleys coming up next week, we’re in a remembering mood. So we dug through the archives and found these great moments from the past decades. In the first year of the Walkleys, the top award went to a young cadet from the Sydney Sun. Sixty years ago Eva Sommer investigated the case of a boat person — a seemingly stateless man locked in his cabin on an Italian cruise liner after he was refused entry by Australian immigration because he lacked ID and a functional memory. Convinced he was no fake, Sommer wrote, “If nothing is done to treat the man he may be doomed to sail between Italy and Australia for the rest of his life.” The boat was minutes away from sailing when Sommer arrived dockside with a local Polish migrant. Sommer stopped the Boat and got the Pole on board. He recognised the man as a compatriot and a survivor of a Nazi concentration camp. The man, Jacob Bresler, had been granted asylum in Australia five years earlier and was entitled to stay. Bresler eventually recovered his memory and lived the rest of his life in his adopted home. 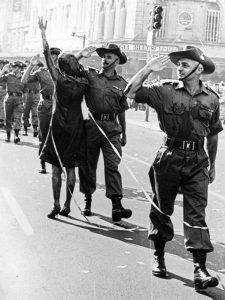 The paint was red, but this was 1966 and the photo was black and white: A protestor daubed in paint throws herself at Vietnam Veterans parade. 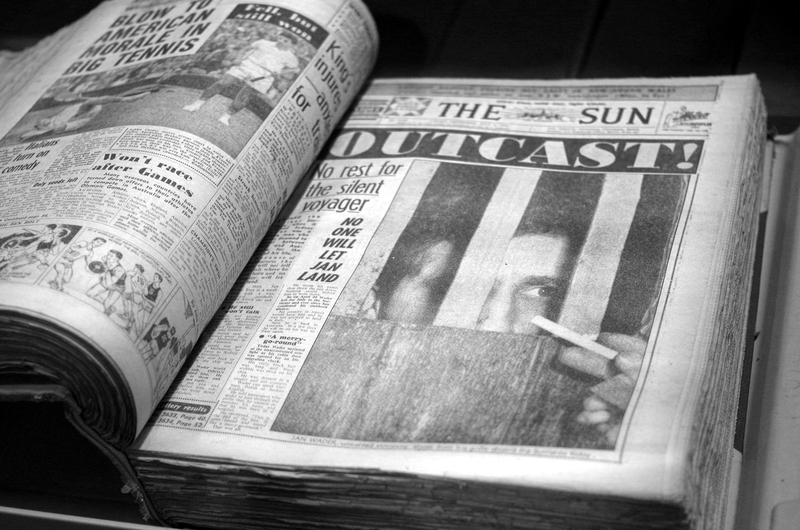 Noel Stubbs from The Sun caught the moment and won the award for best photograph. Tandberg’s 1979 Best Cartoon. 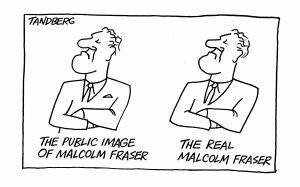 Courtesy of Fairfax Media and Ron Tandberg. 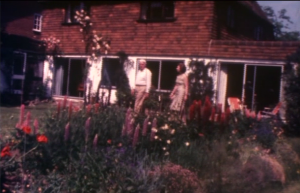 Former GG John Kerr’s UK retreat. Courtesy of Seven Network. 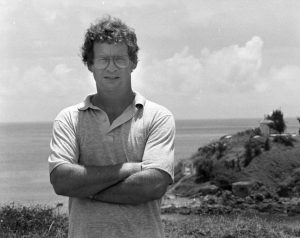 The first TV reporter to win a Walkley was Channel Seven’s Michael Peterson, who tracked down former Governor General John Kerr to his secret garden retreat in the UK. The Dismissal was only three years behind Kerr, and he was effectively in exile writing his memoirs, when Peterson knocked uninvited at his Surrey door. Kerr and his clearly furious spouse agreed to a ‘walking shot’ in the shrubbery but refused an interview. Unwilling subjects. Courtesy of Seven Network. Kerry O’Brien: way ahead of the curve. Courtesy of Seven Network. Remember the recent World Health Organisation report warning of the carcinogenicity of bacon and sausages? 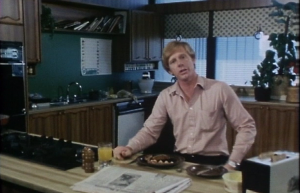 Kerry O’Brien won the Walkley Gold in 1982 with a story warning about the cancer-causing things lurking in … bacon and sausages. And yes, the report featured KOB, fry-pan in hand, cooking the offending carcinogens in a kitchen with lots of wood veneer. Kerry may be about to retire but clearly his story back-list could be replayed for years into the future. 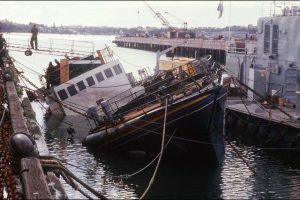 The sinking Rainbow Warrior, in New Zealand. Courtesy of ABC TV. Chris Masters said he felt he was in the middle of an international spy thriller as he tracked the bombers of the Greenpeace vessel The Rainbow Warrior. Starting in New Zealand, the trail wound through various Pacific Islands before landing the Four Corners reporter in France. Oui — it was the French secret service that carried out the bombing, which killed a Greenpeace freelance photographer. 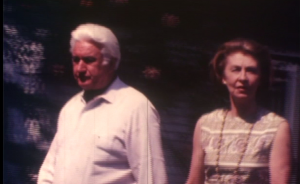 and on his way to the 1985 Walkley Gold. Courtesy of ABC TV. 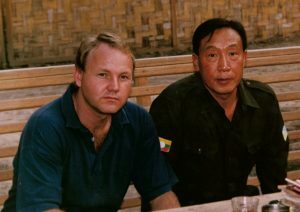 Stephen Rice and drug lord Khun Sa, 1988. Courtesy of Rice. 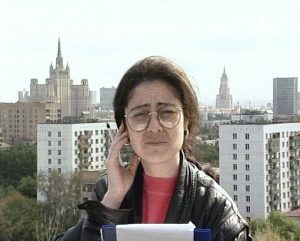 Monica Attard, winner of the Gold Walkley in 1991, reported on the attempted Moscow coup wearing her PJs. Roused from bed by friends telling her there were tanks in Red Square, the ABC’s Russian correspondent had not time to change. At least it was radio. The AFR set up a parallel production office to make sure this story would run. Courtesy of Fairfax Media. The Australian Financial Review editor Glenn Burge was so worried that Rene Rivkin, Trevor Kennedy or Graham Richardson would injunct the paper’s explosive 2003 story on the business-trio’s secret Swiss Bank accounts, he set up a parallel production office outside the AFR bureau to produce it. The story’s lead writer, Neil Chenoweth, says even the AFR’s news conference was in the dark about the exclusive story that was to fill eight pages of copy the next day. “At filing time, the completed pages were just slotted in after 8 pm. At that point you just keep doing the sums — if Rivkin heard about the story, could he get a judge to sign an injunction before the presses rolled.” The story won the 2004 Gold Walkley for Chenoweth and his team of Shraga Elam, Colleen Ryan, Andrew Main and Rosemarie Graffagnini. Walkleys intern Annalise Bolt contributed research for this report.